Saving money is not as easy as it appears to be. It is only when you actually start doing it when you realize how difficult it is. Read on if you're also trying to figure out how to save money. Everyone starts with the best of intentions when it comes to savings - saving money for retirement, for an emergency fund, for housing, for kids’ higher education, etc. 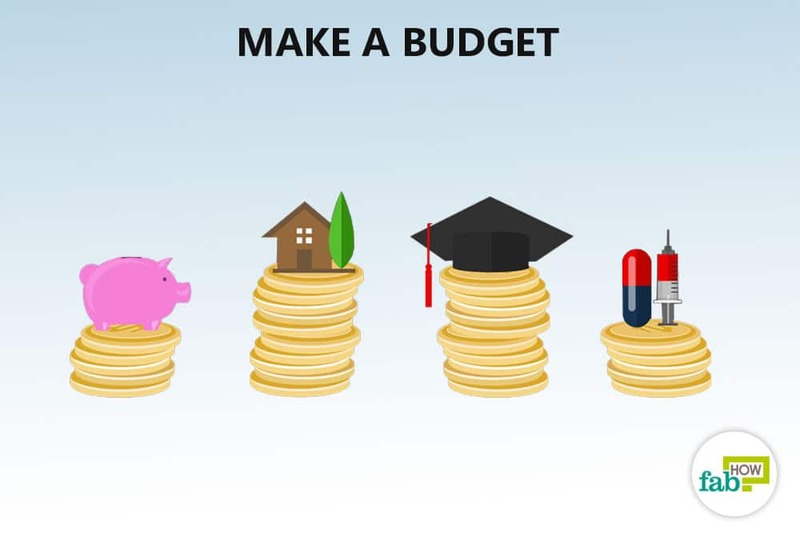 But most of the times some of your bad spending habits break your budget and sabotage your financial plans. When this happens, it's time to start making careful decisions. It won’t be easy to change your bad spending habits and save money overnight. But some strategic changes can help you move forward and take hold of your life. 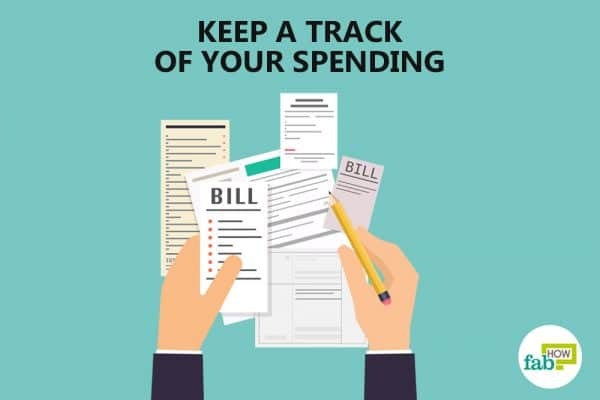 Keep track of your spending. Stack and review receipts at the end of every month. Review your expenses by going through your credit card statements, bills and other records. Try to get receipts for everything you purchase. This will enable you to see where your money is going easily. Set an automatic funds transfer. 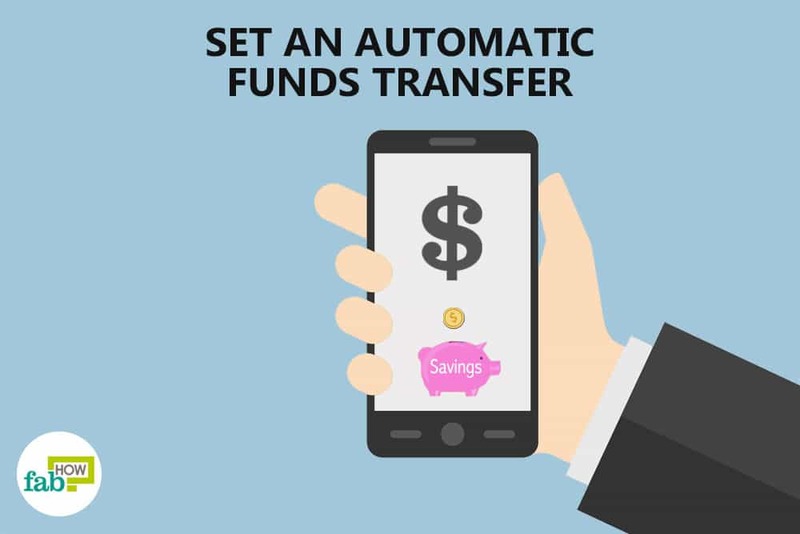 Set a recurring transfer or get a portion of your paycheck transferred from your current account to a savings or an investment account by your financial institution. This will help you limit your spending. Get out of debt. 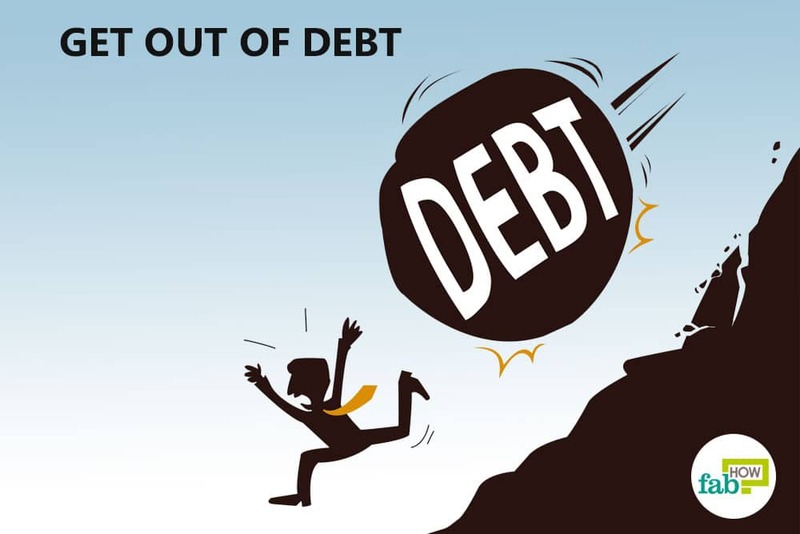 Pay off the debt as soon as possible and try to stay out of it in the future. Spend less than you make and you will be able to avoid debt for the rest of your life. Get free debt counseling. Locate a free consumer credit counselor in your town to work with yourself on consolidating debt and creating a budget. 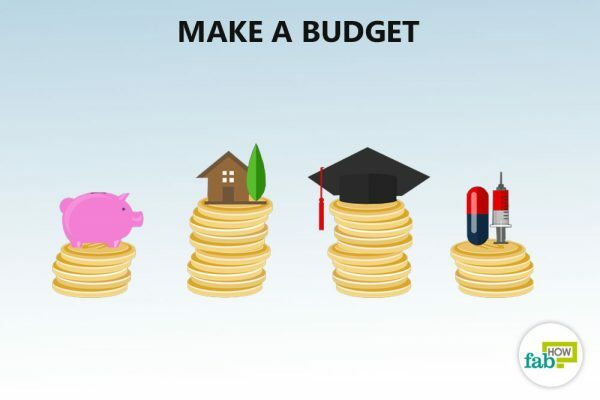 Make a budget. To keep track of your spending, make a monthly budget for food, entertainment, shopping, transportation, housing, and so on. 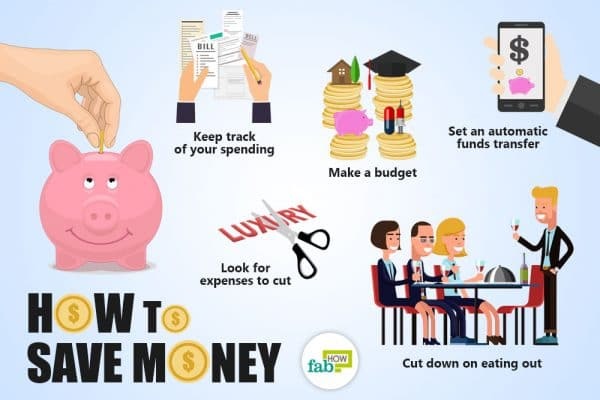 Try to stick to your budget, and if there is any leftover from it, that money can go into your savings. This will help you avoid unnecessary expenses. Set goals for saving. Set some clearly defined goals. It becomes easier to save when you know you must save for something. Set reasonable goals that are within your reach. Decide how much money you want to save in the next year, or how much money you need to save to buy a house. Aim for short term savings. When you keep a short-term goal in sight, it is easier to save more successfully and effectively. Instead of setting a long-term goal of saving $300 a year, try to set a goal to save $50 a month. Have an accountability partner. Get a partner to monitor your progress and keep you on track. It could be a spouse, family member, friend, or mentor. Having someone to hold you accountable can increase your effectiveness. Set your priorities. Should you put your raise toward your retirement plan, your car loan or your credit card debt? You may come across such questions often. Get clear on your priorities and save accordingly. Start small. When you start saving for any investment plan, start with an amount you are comfortable with, and you can afford. Start by contributing small amounts of money. Gradually try to increase your contributions by 1–2% every year. Save as early as possible. Money in your savings account will accumulate interest. The longer your money remains in the saving account, the more interest it gathers. So, start saving in your twenties, even if it’s a small amount. Small amounts of cash left in high-interest-yielding accounts for a longer period can get you a good amount of interest in the long run. Open an emergency savings account. Devote a chunk of your income to a secure savings account so that you can survive in case you suddenly lose your income. 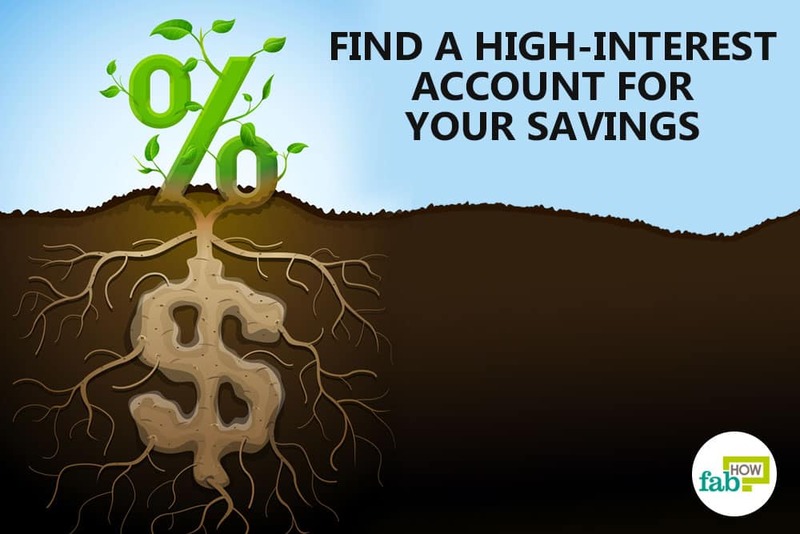 Find a high-interest account for your savings. These types of accounts pay a lot more interest than your savings account. The interest rates of these accounts usually move up as bank interest rates move up. You need to do some research and find out which bank or credit union is paying you a more competitive rate and invest in it. A regular savings account is no place to save your money as most of them hardly pay any interest. Save on Taxes. Do extensive research and figure out ways to avail the maximum amount of rebate on your taxes. Avail tax benefits when investing. Avail tax benefits such as lower tax rates and deferred taxes by investing in stocks, a pension plan, or mutual funds. Make sure to research your options well, seek counsel, and invest wisely. Invest your money in a plan that requires you to fill a withdrawal form. It usually takes a few days to get your money out of such an investment. This will give you time to think about your decision to spend this money. Put bonuses and extras into savings. When you get a raise, a bonus, earn for overtime, get paid commission, consider saving this extra money. Remember you lived on less before, so it shouldn’t be a problem for you to go without this extra money now. Save your loose change. Putting aside all your loose change will allow you to save about 40% a year. Once in a while, put this money in your savings account and in time you will watch it grow. Use your debit and credit cards wisely. Pay off your credit card purchases at the end of the month or try to limit your credit card purchases to those that are possible for you to pay off fully at the end of the month. If you are a debit card user, avoid using the overdraft feature for your expenditures. If needed, quit using them altogether. If you get tempted to use your credit cards, try hiding them or placing them somewhere hard to get to. Don’t make it a habit of carrying credit cards with you all the time. Keep it only for emergencies. Delete your credit card numbers from your online accounts. It’s easy to spend with just a click when you have your credit card information saved online. Just delete that info from there. Now when you need to spend, you will have to search for your card, and this will give you enough time to think about your spending decision. Use a rewards credit card to earn cash back for your shopping. If you use your credit card for regular monthly expenses and manage to pay it off before any interest is charged, you can earn anything around 1–5% back on every dollar you spend. Only use your card for regular planned expenses and bills you need to pay anyway. Luxuries should come last. Once you saved for your emergency account, paid off your debt, established a retirement plan, spend a little money that is left on luxuries. These are goods or services that provide no long-term benefit. 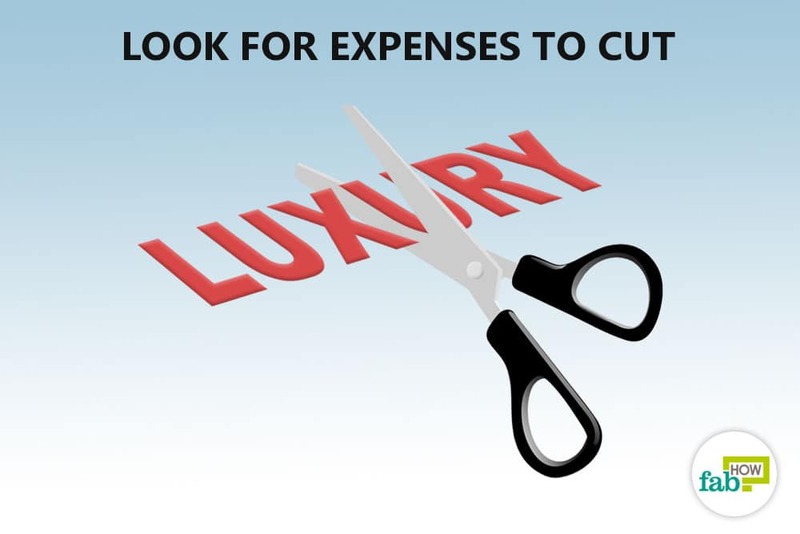 Look for expenses to cut. Watch for anything you don’t need - luxuries, lattes, designer shoes, new phones, household items, or anything that you probably won’t use. Cut back on such expenses and save that money. Another way to save money is by cutting back on what you spend on hobbies - your personal trainer, golf, protein supplements, etc. Save an equivalent amount you spend on non-essentials. Save an equal amount of whatever you spend on non-essential indulgences such as beer, coffee, cigarettes, wine, designer outfits, and others. If you are unable to save the same amount, forget your expensive latte. Avoid purchasing expensive items on impulse. Think over each expensive purchase. Wait for at least 24 hours before making any such purchase. This will allow you to regret less about your impulsive purchases. Pause and think before buying. Whenever you add an item to your shopping cart, stop for 10 seconds and ask yourself whether you actually need it or not. If you don’t find a satisfactory answer, put the item back. This can reduce your impulsive buying to a great extent. Also, avoid buying unnecessary stuff simply because it is on sale. Take stock of what you already own. When you get the urge to buy the crop top you saw the previous day at a store, just go through your wardrobe once. You will be amazed to see how many duplicates of that item you already own. Compare your monthly wage with the cost of your purchase. Divide the cost of the item you are buying by your hourly income. If you are planning to buy a $50 pair of shoes, compare it with your hourly wage of $10. Now ask yourself if the shoes are really worth 5 hours of works? Carry a grocery list and stick to it. When you stick to your grocery list while shopping and avoid buying anything other than on the list, you spend much less money than those times when you decide what to buy when you get to the food market. You can even write down how much you will spend on your groceries beforehand. This will reduce your impulse buying. Try to shop for groceries midweek, as usually, sales start during the week. Try to do grocery shopping when you are in a hurry. If you fit in your grocery shopping in between other important appointments, then you are likely to buy only the essentials and rush off. Doing this will stop you from cruising through the store and buying unnecessary items. Find a cheaper grocery store. Many times, people get into a routine of buying from the same store, even if you may not be getting the best deal out there. Start experimenting with other stores as well. Shop 10 or 20 items you buy most often from a number of stores. You will discover the one that turns out to be the cheapest. Go to store brands. Instead of buying expensive brands, go for the less-expensive, store brand version of a product you buy often. Store brands are generally 40% cheaper compared to their counterparts. Buy in bulk. Purchase non-perishable items you use a lot in bulk; like detergents, soaps, diapers, etc. It can save you a small fortune. Just make sure not to buy in bulk things you haven’t tried before. Seek offers and discounts provided by your company. Discuss with your company’s human resources representative and see if they offer discounted rates on shopping, entertainment, electronics, concerts, and music fests. Take advantage of such offers. Do festive shopping post the festival. This will help you get some of the best deals when brands offer clearance discounts after the festival. You can stock up on gifts for the next year. Plan for a gift well in advance. If you plan for a gift in advance, you can look for a sale, or you can create your own homemade gifts such as soaps, candles, fresh-baked cookies, chocolates, or anything else. Homemade gifts are special as they involve a more personal touch. Shop online. At times, it’s better to buy items online in bulk. You can find discounts on non-perishable goods online. Avoid malls. Unless and until you need to buy something, avoid going to the mall for window shopping. When bored, instead of visiting a mall, try some other entertainment option like visiting a park, walking or jogging, playing cards or puzzles or simply watching a good movie at home. Take a different route to work. If your way to work consists of boutiques and window shops that tempt you to walk inside and own something, avoid the temptation altogether by taking a different route. Go for second-hand clothes. Buy previously used clothes at second-hand stores. You can find good-quality used clothing that can be reused for many years. Look for sales or discounts at discount outlets. Clothes that are sold regularly at many stores and those at outlet stores have huge price differences. Look for sales and discounts when it comes to buying clothes. Buy clothes that can be mixed and matched. To reduce your clothing purchases, invest in clothes that can be mixed and matched. Use simple, timeless pieces that can go well together. A simple and elegant piece of accessory can make even ordinary clothes look exciting. Repair old clothes. Extend the life of your old clothes by repairing them. Don’t throw them out just because of a broken button or a hole in them. You can sew them or repair them on your own and wear them in the house. Clean clothes yourself. Clean and iron your clothes on your own. The amount you spend on laundry services can add up to your savings. Borrow books. Rather than buying books, borrow books from the local library or buy them when there is a sale or a book fair in your city. It can save you a lot of money annually. Sell your old stuff. Go through your closets and dig out things you aren’t using anymore. Sell it online or donate it and get tax deductions. Get a receipt for them. Let your hobby mint you money. If you love painting, sell your paintings or artwork online; if you love pets, become a pet sitter; or if you love writing, become a blogger. There is nothing better than capitalizing on your interests to make money. Grow your own vegetables. If you own a yard, save money by growing your own vegetables. Grow tomatoes, spring onions, eggplant, and others. You can either eat the vegetables fresh or can make juices, sauces, and pastes out of them. Also, your family will get to eat healthy food. Eat in season. Buying nonseasonal fruits or veggies will cost you more. Try to buy produce that is seasonal and is naturally growing in your area. It is a cheaper option. Make your own supplies. Making cosmetics, cleaning supplies, or even sauces and dips at home will save you a lot of money. 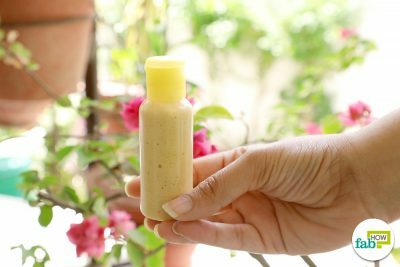 Make your own lip scrubs and rose water at home. You can even make dips such as mayonnaise and peanut butter on your own. It will be much cheaper than buying those at stores. Break bad habits. Other than being unhealthy, bad habits such as smoking, drinking, and indulging in sugary sodas can also burn your pocket. Not drinking beer for a year could save you hundreds of dollars; going without smoking for a year could save you $1000, or giving up on soda for a year could save you at least $100. Whenever you feel the urge to smoke or drink, divert your mind or find out the triggers and avoid them. Cut down on expensive drinks. Replace your expensive drinks with simple coffee. A cappuccino or latte every day would prove to be way more expensive than coffee. If you can’t resist, there are great recipes for making some of these drinks at home instead. Homebrew your beer and wine. If you are unable to cut down on alcohol consumption, brewing your own wine and beer at home can help you save a lot of money. You can start by buying DIY brewing kits. If you are a seasoned do-it-yourselfer, you can also try to make beer from scratch. 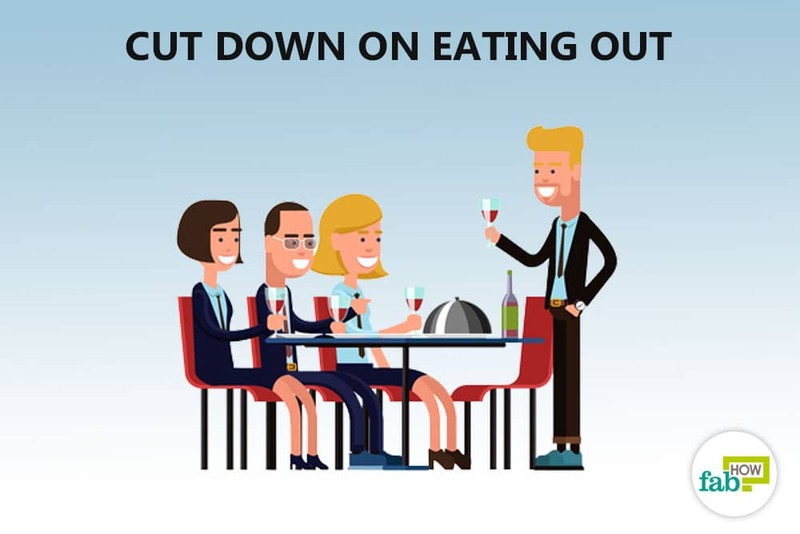 Cut down on eating out. Try to eat out fewer times each month. If eating out costs you average $50, cooking a meal at your home will probably cost you $10. You could be saving $40 monthly. Organize potlucks rather than dining at restaurants. It is always cheaper to stay in with your friends and come up with your own entertainment options. Host a pitch-in dinner or potluck and play cards or watch a movie. You will save money as well as have fun. Bring lunch to work. Instead of buying lunch every day, cook your meal and take it to work. It will save you a lot of money yearly. Eat a healthy breakfast. Eating a healthy breakfast will fill you up for the day, and it will also curb your craving for a big and expensive lunch. Use a crockpot. Make inexpensive and filling meals with a crock pot or slow cooker. Slow cookers save lots of money by cutting down your cooking costs. Plan for no-cooking nights. Have some frozen meals set aside on nights when you don’t feel like cooking. Instead of relying on junk food or dining at expensive restaurants and spending money, just heat these frozen meals and eat. A batch of meals that can freeze well, such as lasagna, noodles, rice, and chicken can be convenient. Reuse leftovers to make a new dish. Instead of creating a new dish every day, get creative with leftovers to make something delicious and new. Also, there is nothing cheaper than eating leftovers. Use your leftover canned tomatoes to make instant salsa by mixing lemon, pepper, onions, and others. Avoid spending money to make you feel better. Don’t get into the habit of spending money to relieve stress. Instead, find other ways to de-stress yourself. Do yoga, meditation, aerobic exercise, take a walk or simply listen to relaxing music when stressed out. Spending money to wind down after a stressful day will not help you in the long run. Search for inexpensive entertainment in your city. Search local newspapers and websites for free or low-cost plays, concerts, film screenings, and other events. You can even check out your town’s website or local library to know about free meals, free entertainment, etc. Find inexpensive entertainment for children. Play in the backyard, take them to a park, paint with them, run after butterflies, pick apples, or plant a tree. Spending time with your children is more important than spending money on them. Cut down on cable channels. Renting a film a week is much better than watching a premium cable channel that may cost you more than $100 a week. Also, reducing your television time can help you save some money. Live near your workplace. Although this is not always possible, living near your workplace will save your transportation cost to a great extent. Take public transport. If a transit system is available near your place, take it to work instead of taking your own car. You can even get an annual transit pass. Carpool to work. If you live near any of your coworkers, consider carpooling to work. It could save you both a lot of money. Invest in a fuel-efficient car. A reliable and fuel-efficient car will help you save money in the long term. Never let the engine idle while driving. Saving fuel amounts to saving money. You can save a lot of fuel just by getting in the habit of killing the engine whenever you have to stop for more than 10 seconds. Letting your car's engine idle for more than 10 seconds burns more fuel than restarting the engine. As a bonus, you will also cut back on your share of air pollution. Clean your car’s air filter. A clean air filter will give you better mileage and save you money. Inflate your car tires. You can improve gas mileage by making sure your car tires are set to the right amount of air pressure. Plan your fill-ups in advance. When you are on the verge of running out of your gas, you will have to accept whatever gas price you run into. You can’t be choosy about which gas station to go to. If you plan your fill-ups in advance, you have the choice of going to gas stations with the best price. Compare prices of other auto-insurance policies. Before renewing your auto-insurance policies, check out the rates of competing companies. Check for multipolicy If you have your car insured under one insurance company and your home insurance under another one, check if either will offer discounts for putting both the policy under one institution. Go for Insurance, especially Health Insurance. As it can save several thousand dollars in possible hospital expenses, you can also take advantage of tax benefits offered on some insurance premiums. Other options are starting a Health Savings Account or a Flexible Savings Account. Don’t pay for space you don’t need. You may love living in spacious and large apartments or houses, but it would cost you a fortune. You can either rent out a part of your house or a room or move to a smaller house. Smaller homes are less expensive to keep and also have low-cost maintenance, i.e., less insurance, taxes, electricity, etc. Also, having a roommate will further reduce your expense. Rent out unused space in your home. If you have an extra room in your house that remains unused for most of the time, rent it out and earn extra. Invest in energy saving good-quality appliances. Although a new appliance might cost you a bomb, the continual use of an energy-efficient appliance will help you save significant money in the long run. Use a surge protector. A power surge can damage your equipment. Keep your appliances plugged into a power surge protector. A surge protector will help you save energy, thereby lowering your electricity bill. Unplug electrical appliances when not in use. Electronic devices consume energy if they are plugged in, even when they are not in use. Keep them unplugged when not in use, to cut down on energy consumption and save money on your electricity bills. Do a maintenance check. Check your electric appliances such as microwave, refrigerator, air conditioner, heater, and dryer for clogged dust and dirt. Look behind your appliances, vacuum them frequently and check all the vents and openings. Dirt and dust can hamper the working of your appliances. The more efficiently they work, the more you will be saving on your electricity bill. Do home maintenance on regular basis. Regular home maintenance will help you save money and also add to your property’s value. Monthly or regular maintenance will make sure that small jobs will not turn into massive repair or construction work, saving huge amounts of money in the future. Fix leaky faucets. Leaky faucets can increase your water use by 25–60%. Air-seal your home. Air leaks can cost you a lot of money. It can make it harder for your air conditioner or heater to keep your home cool and warm. Seal your home and save money. Switch off the lights. Leaving the lights on in your home cost money over time. Switch off the lights the moment you step out of your room or your house. Turn off the lights even when you have plenty of natural sunlight entering your house. It can reduce your electricity bill. Use LEDs. Swap your traditional bulbs out for energy-efficient light bulbs. Fill up your freezer. Your freezer’s efficiency improves when it is full. If your freezer is half-filled or empty, it needs to work more to keep the items cold. If you don’t have enough stuff to fill up, use bags of ice. Turn off the heat dry function of your dishwasher. Allow the dishes to air-dry as it will help you reduce your electricity bill. Line dry your clothes. It takes a lot of energy to operate an electric or gas dryer. Also, clothes that dry on a clothesline last longer. Wash your laundry in cold water. Almost 90% of the energy consumed by the washing machine goes to heating water. Switch from hot to cold water to save energy. Lower your water heater’s temperature. Heating water requires a lot of energy. Try turning down the thermostat to 120 degrees. Remove services you don’t use in your mobile. Take a look at your monthly mobile usage and see whether there are any services that you aren’t using. Cancel them. Reduce your cell phone costs. Look at the area coverage, roaming cost, and termination charges. If need be, switch to some other service provider offering low call rates in your area. Make sure to get the right calling plan activated, something that suits your calling pattern. Spend less on phone calls. Reduce your cell phone usage. Use applications such as Skype, Vonage, Whatsapp, etc., that use the Internet to make calls. Phone calls and text messages are free on these applications. Cancel unused club memberships. If you are paying dues for your gym membership or any other club membership that you hardly use, cancel it. You can renew them later when you need it. Cancel magazine subscriptions. If unread magazines generally tend to pile up at your place, it’s likely that you are not reading the magazine you have subscribed to. Cancel such magazine subscriptions. Check for cheaper airline fares when traveling. Airfares and travel expenses vary greatly based on how far ahead you reserve them. Shop around for the best deals and give yourself plenty of time to plan. Cut down on vacation expenses. Instead of going on an expensive trip to an exotic locale, explore your city and your surrounding area. Go on a road trip or a camping expedition. Sometimes a weeklong trip closer to home can be cheaper yet more memorable. Buy prescription drugs from a low-cost place. Purchase low-cost drugs from local pharmacists, local supermarkets, and discount centers. Go for generic drugs. A generic version of a drug or a store-brand medicine can often cost you 20–40% less compared to the highly advertised brands.